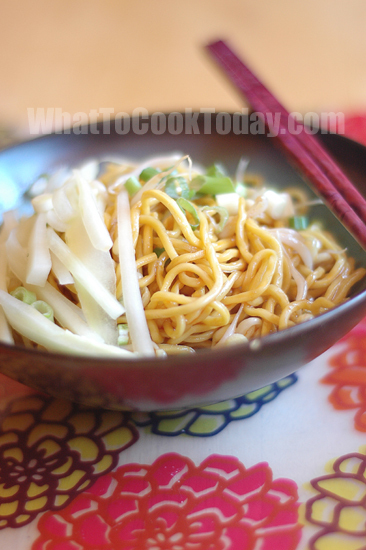 Cold noodles is another tasty street foods inspired by Sichuan cooking that I personally really enjoy. I don’t get paid for saying this, however, I am really grateful that the Grand Szechuan restaurant in Bloomington here in Minnesota exists. Nice place and very nice food. We often order cold noodles when we dine in there. There are many different styles of Cold noodles. This recipe is from Taste of China cookbook by Ken Hom (yes, if you’ve been following my blog, you probably know I’ve been experimenting with few of his recipes) and it is from Wangfujing, the major shopping area in the capital. 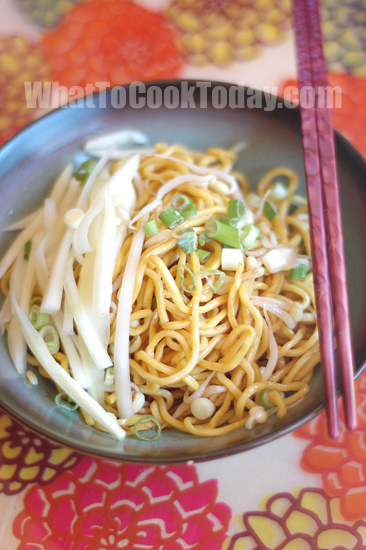 This dish is very easily made, can be served at room temperature and I actually double the recipe for the sauce and keep them in a fridge, so I can easily use it when I want some cold noodles. What can I say, I can’t have enough. Why is sugar listed twice under the ingredients section? Hi, it’s an error. Thanks for letting me know. I’ve updated the recipe.